Instead of “How now brown cow” we can say “Hey, Lucy it’s letter L”. Why not? 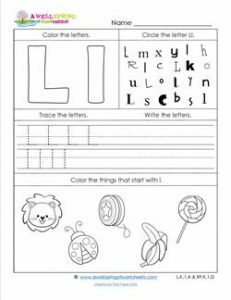 It makes more sense, that’s for sure, since you’re on the letter l page of our abc worksheets. Kids get to do lots of important, not senseless things, on this worksheet. Like tracing and writing letters and identifying each Ll in the bunch of letters. Grab those crayons because there’s coloring to be done. And last, but definitely not least, kids get to say the names of the objects and decide which ones start with the /l/ sound.